Love them or hate them the fact of the matter is that performance poly t-shirts work! Whether it’s dryblend, dri-fit, fit-dry, tech shirts, regardless, they work by wicking the moisture away from the body keeping you cool. In this line of business we get massive amounts of feedback from our customers because to the average person poly t-shirts and apparel are still relatively new. My personal history with performance poly goes over 10 years only because I play a lot of golf and golf companies were among the first to bring moisture wicking shirts to the masses. Custom Printed Performance Poly Dri-fit t-shirts aren’t just a trend, they are here to stay. We get a lot of skeptics who are first time buyers when they come in our shop and want a custom screen printed order of poly t-shirts. Normally they call for them because people in their company are asking for them or people on their ball team are requesting them. More often than not the person floating the bill isn’t familiar with them. So we print a custom run of their logo on performance tees and get plenty of feedback on their next order. They either order them again or go back to the traditional cotton t-shirts. There is no right or wrong here but if you go outside and perspire for any length of time it’s a scientific fact that cotton shirts become damp and heavy while a performance poly stays dry. It’s not whether or not the shirts do their job that causes people to like them or not, it’s simply a texture thing and most certainly there are some brands that feel better against the skin that do others. From a screen printers perspective we have the knowledge to educate our customers on the best shirts when it comes to their custom screen printed t-shirts. We can advise them on cost associated with different brands, which brands hold up better than others and which brands feel better against the skin. Today with the competition among apparel brands there are going to be many options regarding price, colors, and styles in the performance poly t-shirt arena. Some of the best shirts happen to be the most budget friendly as well. 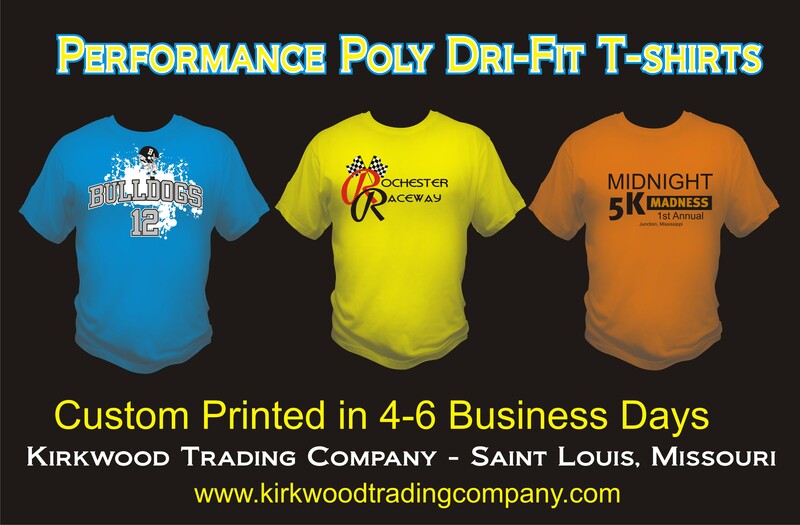 Contact Kirkwood Trading Company in Saint Louis Missouri and we’ll help you with your next custom screen printed performance poly t-shirt order. All of our printing is performed in-house to ensure quality and fast turn around times.